As we did some time ago, we brought you a selection of resources for keeping your collection in order. Please don´t hesitate in adding more examples using the comments down below. Solid wood crate. Tired of cheap and boring slat crates that are air nailed together? 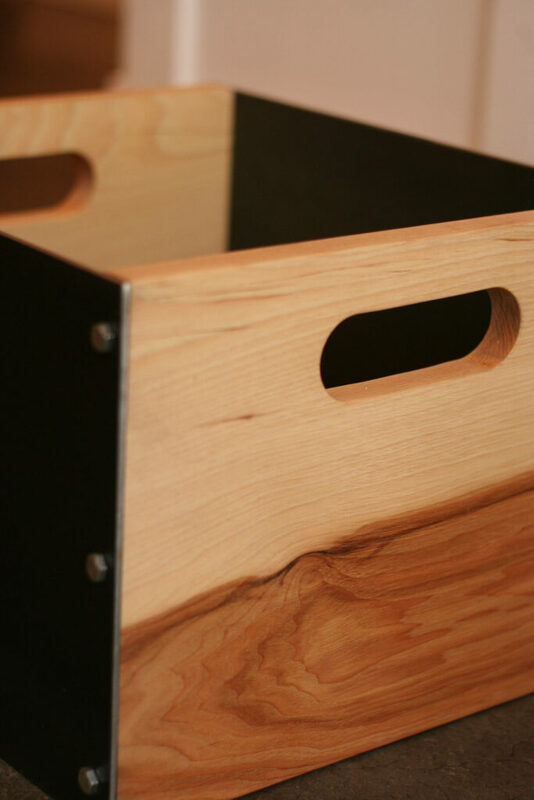 These crates are assembled using solid box joint joinery that looks great and is incredibly strong. The bottom of the crate is made out of birch plywood that provides a strong bottom that will not warp or break and has no holes or slots for things to fall through. There are no nails or screws harmed in the construction of these crates, because none were used! Great for storing hats and gloves, toys, dog leashes, books, or your collection of vinyl records! 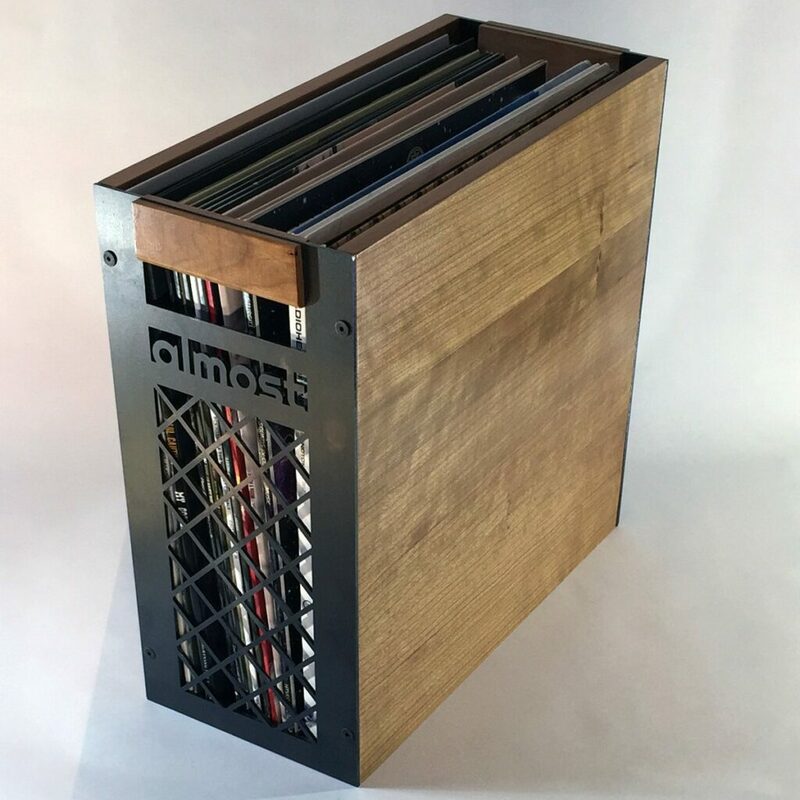 Store your vinyl in style! 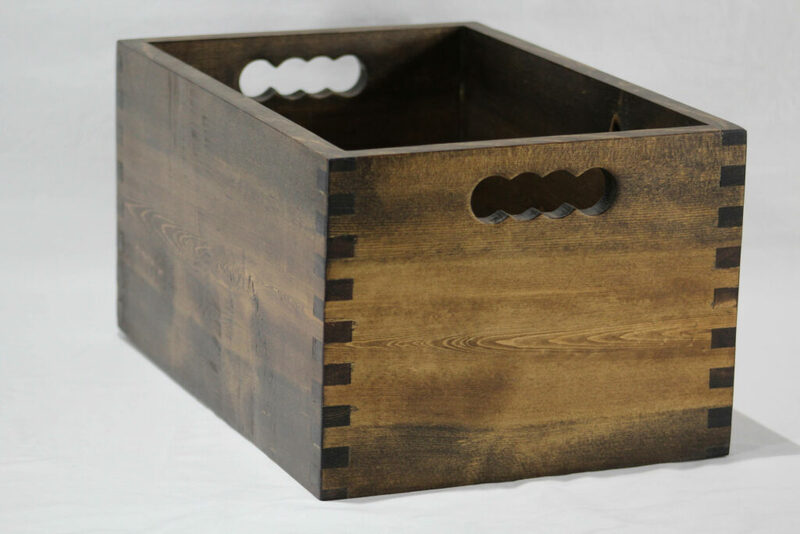 All crates are made out of 1/2″ birch ply, giving them a nice wood grain that is perfectly accented with stain. Crates hold approximately 65 – 75 single LP’s/records each (double LP’s and box sets would bring the total down). 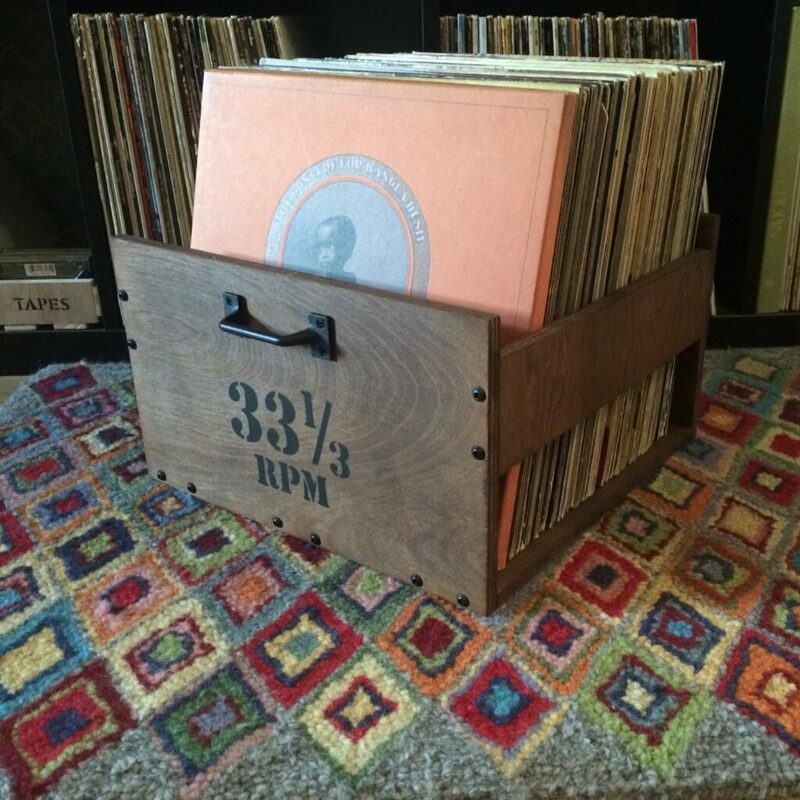 If you need a crate that can hold more records, contact us and we can make you a longer crate. Lettering: Hand painted and customized to your specifications (contact us for long or complex customizations). Handles: Metal handles ( in a variety of finishes) attached to the front and back of the crate. When purchasing, just note which finish of handles and hardware you’d prefer (see pictures for available finishes). 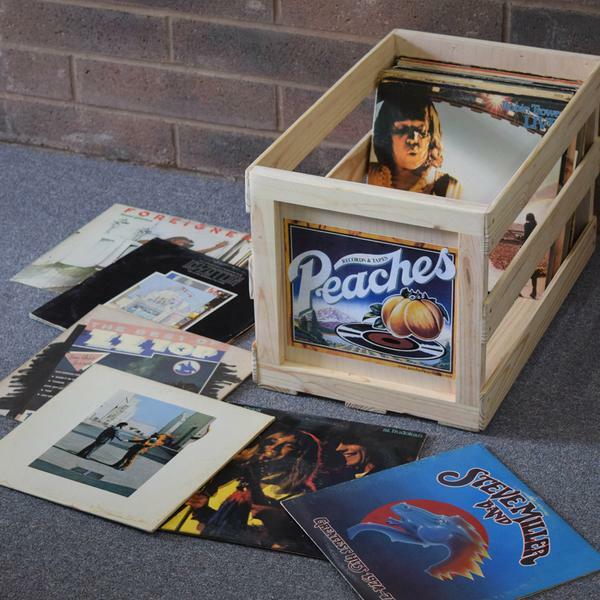 Our most popular option, these classic crates provide storage for 120+ albums. Actual dimensions 13.5″ x 13.5″ x 23.5″ (WxHxL). Please note these come unassembled to save on shipping and simply require a screw driver for quick assembly. They can be assembled as top loaders, or as side loaders if you prefer to set up more like a shelf. 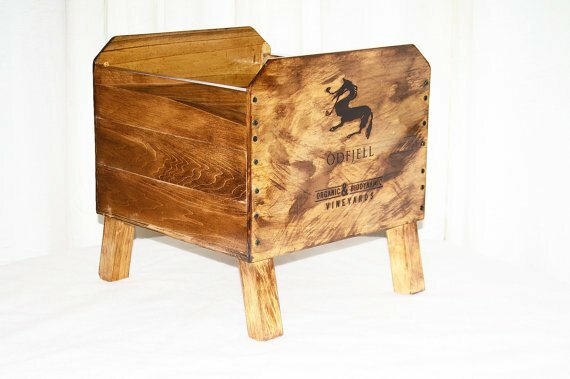 Handmade here in the USA, these crates will last a lifetime. This is the newest addition to our shop and my personal favorite. 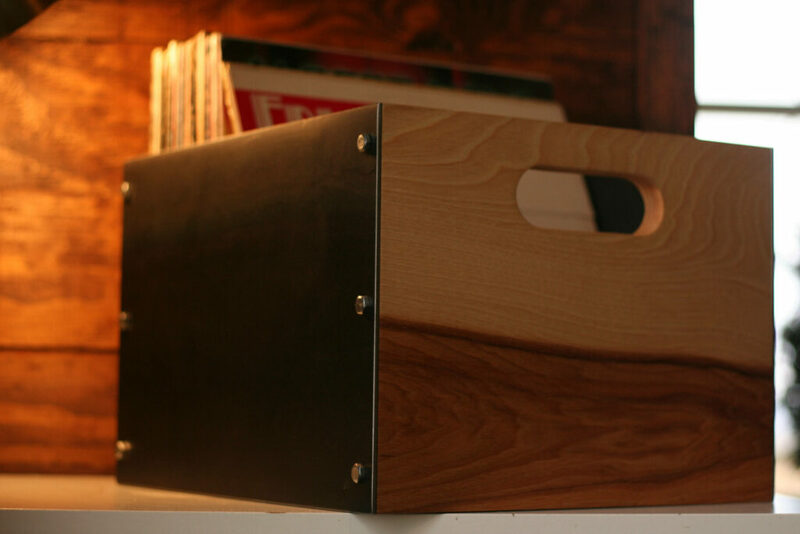 While it is sturdy enough to hold just about anything you can fit inside, it is designed to hold 75 records. The front and back are solid hickory and the sides are 1/8 metal. They are fastened together with stainless steel bolts. The bottom has three slats to hold the records in. The crate measures 10 inches tall 13 inches wide and 15 inches long. The metal we use is raw unfinished metal which means there are some scratches, spots and color differences. The color of the hickory will vary quite a bit from piece to piece but we always try to get some dark and light contrast in each piece. Decorate your home in modern style with this Goodspeed Record Storage End Table. This table is perfect for use as a side table next to your chair or sofa in your living room, as a record storage table next to your turntable in your entertainment space, or even as a nightstand in a bedroom. This end table is constructed of a metal frame with a black finish, a clear glass top, and a walnut brown wood cube. 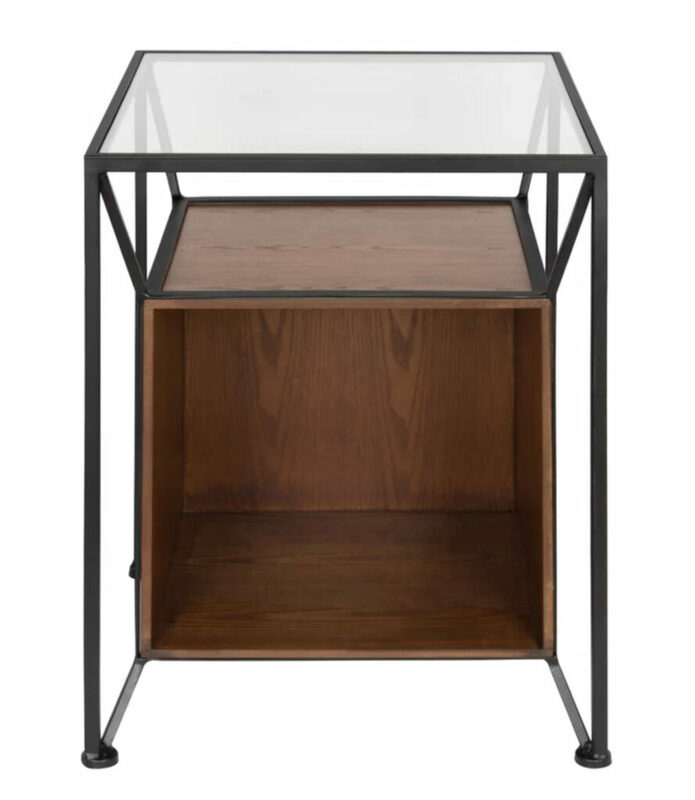 Bring modern style into your home with this gorgeous metal storage table. Remember the days when you could carry around your records in a milk crate? Remember how hard they were to find, not to mention legality of ‘permanently borrowing’ one? Well, it’s 2018 now and we’re all grownups; I think we should adjust accordingly. These crates are not only optimal for vinyl storage, they also are finely made to stand alone as artwork that will seamlessly fit into your furniture collection. Besides, who wants to carry their hip heap of records in some plastic piece of garbage as you’re running over to Charles’ house? Well, we have the solution for you. 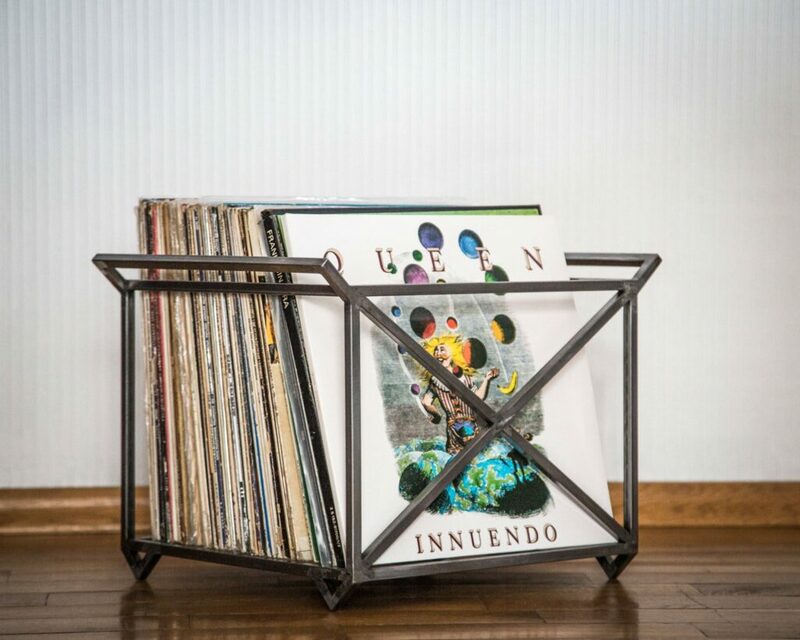 Our contemporary milk crates are designed to give you the flexibility to grab records and go in style, while also pairing well for storage when you return. A pair will merge perfectly with the standard 13″ x 13″ Ikea shelving system you’re already storing your records in; they’ll just look a whole lot better now. The sides are made out of 1/2″ Cherry cabinet grade hardwood plywood good 2 sides (G2S) grade A-1 with a 5-Ply veneer core. The Cherry hardwood veneer is plain cut for a uniform grain pattern. The handles are made of solid Cherry hardwood. 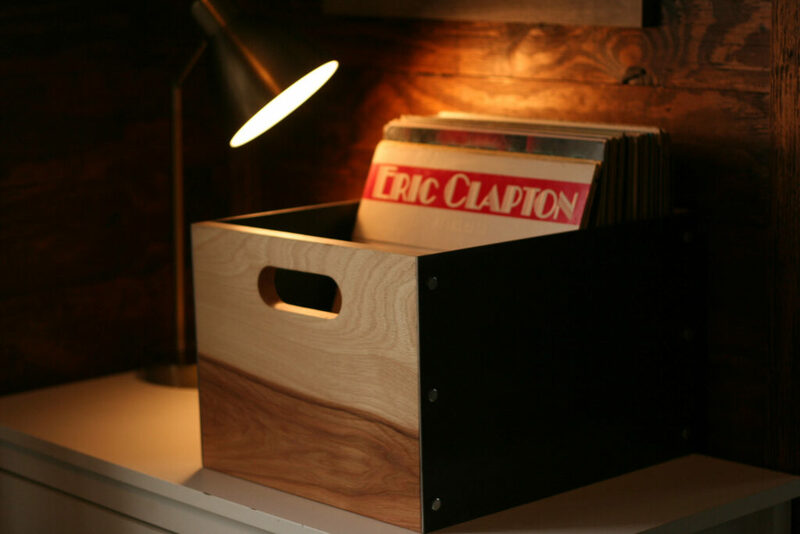 Hand-forged record crate minimalistic style. The crate solves the problem of keeping your collection in order. Allows for easy storage of your precious collection. Easy to handle – can be easily lifted by the sidebars. Beautiful raw metal protected from oxidizing by a transparent finish. Four triangular shaped legs. Light construction doesn’t allow dust to accumulate in your precious collection. Please call us if you require customization. -Has four stylish triangular shaped legs. -Looks cool on the floor, shelf or desk. I-CUBE vinyl storage cubes, LP storage units, 12” record boxes and modular DJ furniture is a high quality, professionally designed & built vinyl LP record storage system, and the ultimate solution for record collectors, vinyl fans, DJs & music lovers who require a fully assembled, stackable and expandable system of storage cubes, boxes, units, shelves & furniture in any shape, size, colour or finish. Explore and order our huge selection of cool, contemporary and handcrafted storage options to create the perfect solution to your style & storage needs. Mix and match different colours, free stack, easily fix to a wall or configure these cubes and units any way you like to create a stylish, unique, individual and contemporary vinyl LP record storage solution – or use around the house and office as a stunning, bespoke, space-saving cube shelving and display unit for books, clothing, footwear or your favorite things. Our selection of modern designs, colors and real wood finishes make it easy to configure the ultimate vinyl storage system that will bring a stylish feel to your chosen space. I-CUBE modular LP storage units, 12″ record boxes and DJ storage furniture is handcrafted in the UK using FSC certified high strength birch plywood and eco friendly solid MDF wood, and is delivered fully assembled and ready to use – simply unpack, stack and get your vinyl LP records beautifully displayed, safely stored and easy to organize and access. So dig out those dusty grooves, retro LPs, vintage vinyl and classic 12″ tracks, sit back, relax and enjoy your favorite music in style with our high quality, modular vinyl LP record storage furniture system. We hope you enjoy browsing our fantastic range and creating the perfect solution to your vinyl storage needs. Please contact us for further record storage, maintenance, advice or assistance. 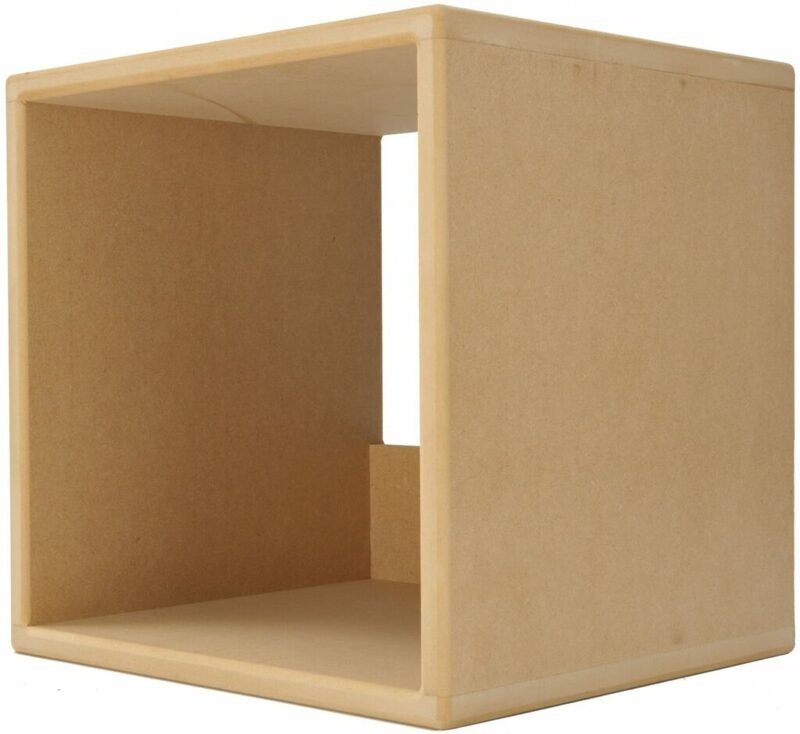 I-CUBE vinyl LP record storage furniture is fully handmade and delivered assembled and ready to use. Beautiful, bespoke, modular vinyl storage furniture at affordable prices. Can be used in the garden, the kitchen, or as an album older. This designer creation will hold 90 plus albums easily and you can place the albums in the holder in any direction. Bottom base of crate has 2 plywood layers for strong support. Side slats are Ash and Ambrosia Maple – legs are pine. The ends are from 2 different wine crate tops – same winery. Crate is reinforced with carpenter wood screws and nails. It is sanded smooth and then stained with many stains. Finally, Kate used 5 coats of Tung Oil for a lasting sheen. 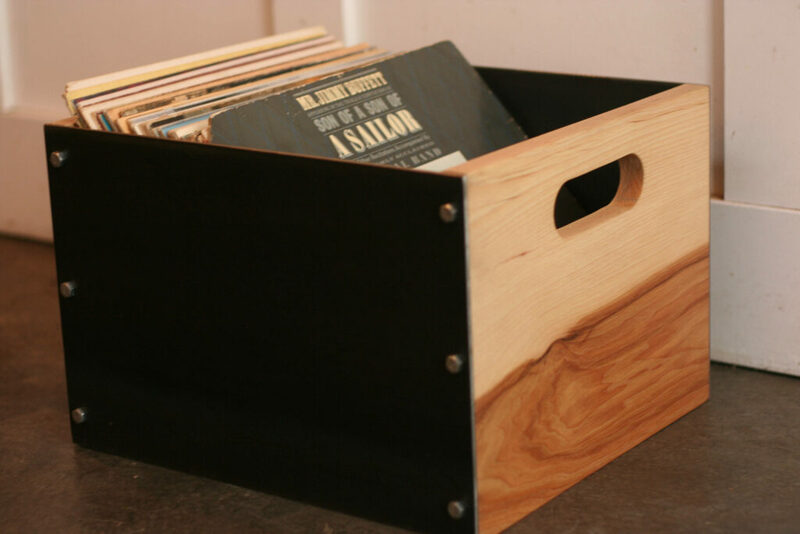 GREAT way to store you cool vintage items and hold records also! 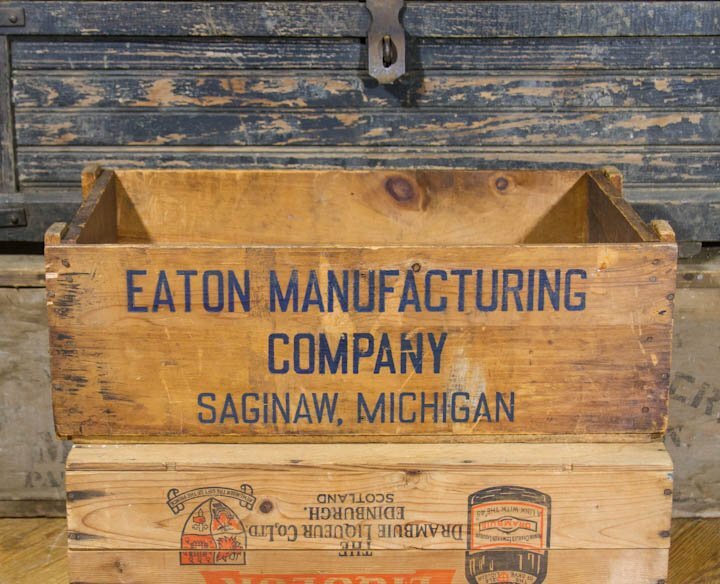 We just Love to pick for Antique Boxes and have curated a whole Etsy shop section filled with them for you to enjoy below!